Who does not like a good Kilchoman (and most Kilchomans are very good indeed). It’s nice we’re getting some 10+ year olds now, and this one is a really nice one! Distilled at Kilchoman, on 6th March 2008 and matured in a fresh bourbon cask from Buffalo Trace for 10 years, this single cask expression was bottled exclusively for Loch Fyne Whiskies on 19th March 2018. One of Kilchoman’s unique ‘100% Islay’ releases, this single malt Scotch has been produced with barley grown, malted, distilled and bottled on Islay. Only 239 bottles have been filled from cask 84/2008, each one presented free from chill filtration and artificial colouring at a strength of 53.2% abv. We featured this bottle on our whisky club’s (Holy Dram) Feis Ile 2018 etc. tasting , and it was quite a hit, and not very surprising. A cask strength 10 year old Kilchoman 100% made on the island. Can’t get better than this even before you’ve tasted some, right? Nose: Very nice peaty start, clean and lovely with a bright vanilla undertone, there’s some salt, a touch of tar, smoke of course, and a nice peat reek, a mineral note as well, and nice candied sweetness that works well with the smoke. quite elegant and surprisingly restrained for a 53% nose..
Palate: Lovely sweetness that goes well with the peaty / ashy smoky notes, sweet old school candy with infused smoke, vanilla custard, some Scottish Tablet , a hint of fruit as well. Finish: Smoke, spice, sweet pastries, gentle wood. 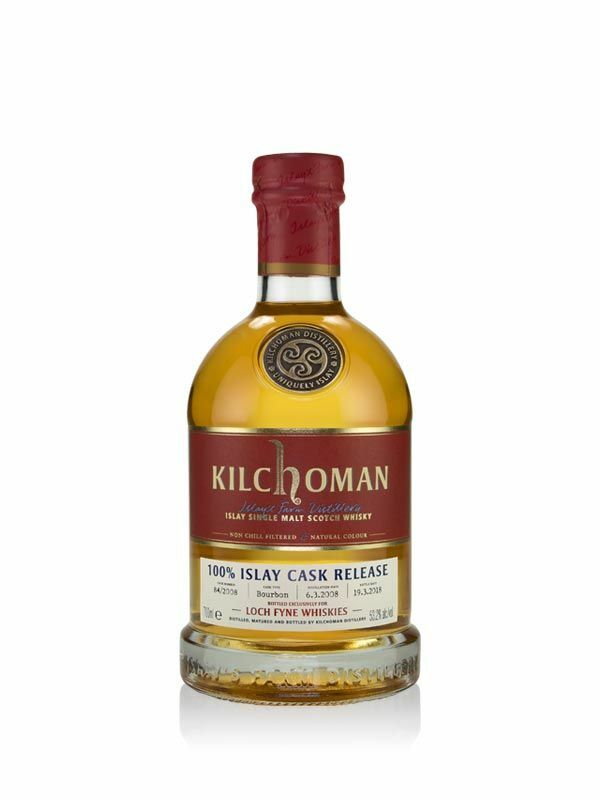 Great stuff from Kilchoman, a mature, rounded and creamy / fruity profile which is surprisingly still available on the LFW site, grab one while it lasts! Nice. More interestingly, Loch Fyne also has one of the first 12-year bottlings for not a lot more money.